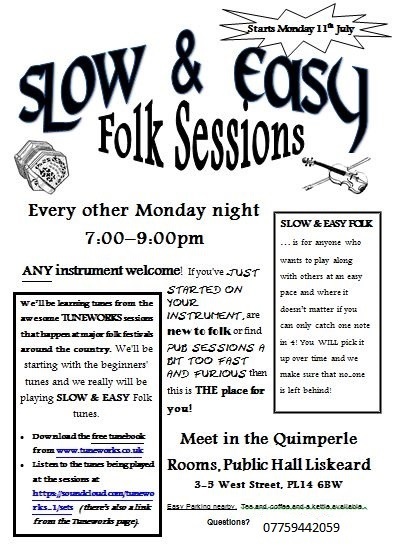 We meet every other Monday from 7 to 9 pm in the Quimperle Room at the Public Hall. These sessions are for people who want to play along with others at an easy pace – it doesn’t matter if you only catch one note in four, you will pick it up over time and we make sure no-one is left behind. ANY instrument is welcome, if you’ve just started on your instrument, are new to folk, or find pub sessions too fast and furious then this is the place for you! Playing traditional music is not an elite activity, it’s for anybody. It belongs to everyone who plays it and loves it. Every time you play a tune with others, or pass on a tune you’ve learnt, you are part of making the tradition live. Lots of us were in this position. We don’t want you to stay there longer than necessary. Because playing music together is, really, the best activity in the world.